History records little of the way they lived, or the way they died. In fact, history hadn't even taken notice of where they were buried, but in May, 1991 during the pre-construction phase for a federal office building, they were discovered. The remains of freed and enslaved Africans who had lain under the soil of the city that grew up around them. The site is unique. It is generally considered to be the only known urban pre-Revolutionary African cemetery in the United States. During the 1700s when the burial ground was an active cemetery Africans were estimated to make up almost 20% of the population of New York City. For those who had long considered that slavery, and even the presence of Africans, was restricted to the southern states, the discovery provided a reminder that New York did indeed have an early African community. The remains of 419 men, women and children were found, removed, and now returned to the earth in a fenced memorial plot behind building at 290 Federal Plaza. The site filled with grass and flowers, and a gravel path, has been designated both a National Historic Landmark and a New York City historic district. Large boards provide information about the burial ground, and a memorial structure is planned. Inside the building the lobby art and history meld to pay respects to the people buried there and to the human condition. The Office of Public Education & Interpretation (OPEI) provides lectures, tours, films and educational outreach. The Burial Ground Site is located at 290 Broadway between Duane Street and Reade Street. OPEI is located at 201 Varick Street (between King Street and Houston Street) Room 1021. 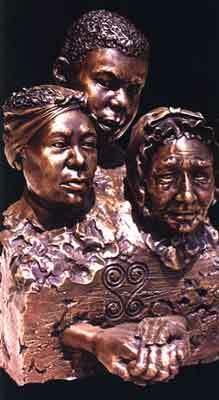 For more information visit African Burial Ground.